We were delighted to attend MINT 2018 (the Masterclass In Neuro Rehabilitation) organised by Hobbs Rehabilitation in association with ACPIN (the Association of Physiotherapists in Neurology). MINT featured presentations on the latest technology in neuro rehabilitation, as well as masterclasses which were led by experienced clinicians. 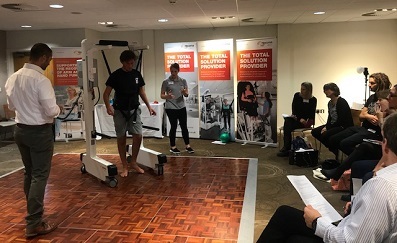 During the event, our partner Hocoma hosted a masterclass on their Andago free-moving overground body weight support system, which they demonstrated to neuro rehabilitation professionals. It was fantastic to see the Andago in action and get clinicians hands-on with the device. It was also a pleasure to meet Angus, who was the patient subject for the Andago during the masterclass. Angus writes a fantastic blog, In My Mind I Am Free, where he shares his experiences of living with Guillain–Barré Syndrome (GBS). GBS is a rare autoimmune disorders which can cause paralysis, and Angus talks about his recovery on the blog. Please do follow Angus’ blog and keep an eye out for his upcoming book where he speaks more about his experience. If you would like to find out more about the Andago or any other Hocoma products, contact us!